2689 Bechelli Lane, Redding, CA. The Winnemem Wintu Tribe will hold a rally at the Federal Courthouse in Redding to call for justice and for the court to rescind the punitive citations served on Chief Caleen Sisk at the end of the traditional Balas Chonas (Coming of Age Ceremony) in July. The rally takes place on the day that Chief Sisk is scheduled to appear in court, for a 9:00 a.m. hearing, to respond to the charges, to which she intends to plead “Not Guilty." There will also be an educational pre-rally event at the Redding library Monday evening (details below). California has an ugly history of genocide against indigenous people, which includes the criminalization of indigenous religion. 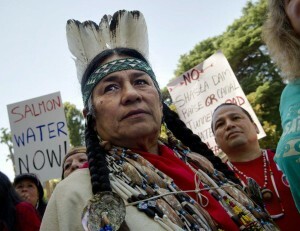 The Winnemem Wintu believe the citations are a continuation of these policies, and the federal government and U.S. Forest Service has neglected its duty to protect indigenous cultures, as required by the American Indian Religious Freedom Act, the United Nations Declaration on the Rights of Indigenous Peoples and the First Amendment. In July, after months of public pressure, the US Forest Service finally agreed to impose a river closure so the Winnemem Wintu could hold our Coming of Age ceremony in peace and dignity, free of public harassment. However, on the eve of the ceremony the agency pressured Chief Caleen Sisk to sign a flawed permit, and after verbally agreeing to the tribe’s use of a motorized boat, omitted the agreement from the final closure order. During the ceremony and river closure we were threatened by members of the public on land and water, while U.S.F.S. law enforcement officers spent more time harassing tribal members and supporters than responding to the threats and unlawful behavior around the closure. In addition, they tried to stop us from using our own motor boat (as had been previously agreed to) to ferry elders, including disabled women, across the river for ceremonial purposes. On July 4th, USFS law enforcement officers entered ceremony grounds and served Chief Sisk with two citations, each punishable by $5,000 or 6 months in prison – one for using a motorized boat to ferry elders across the river in the closure area; the other for violating the terms of the special use permit.